For nearly a century, members of the UW-Madison Department of Medicine have worked together to heal patients, discover ways to advance care, and train the next generation of doctors dedicated to internal medicine and its related specialties. Founded in 1924, the department emerged as a university unit as the medical school transformed from a two-year basic science program to a four-year curriculum. 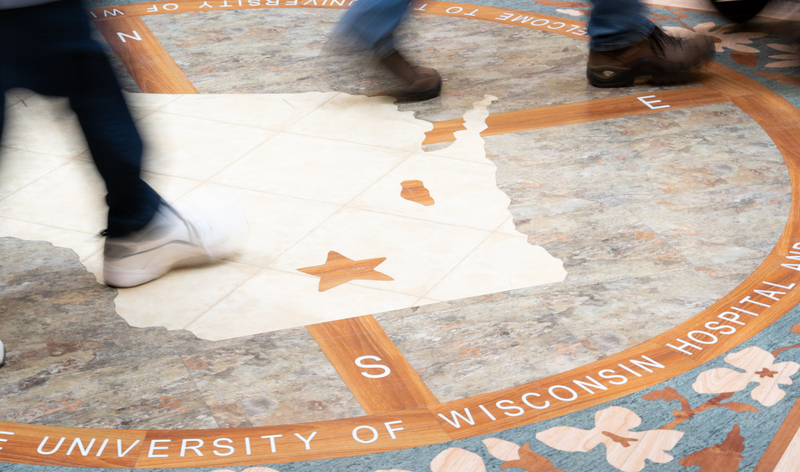 Today, we form the largest academic department in the entire University of Wisconsin statewide system. Despite its size—or perhaps because of it—the structure of our department and its relationship to other parts of the university is a frequent cause of confusion. Here we present a field guide to the department, pointing out features of our corner of the university and its associated health care system. The breadth of department members’ work is a reflection of the expansiveness of the field of internal medicine, which involves diagnosis and nonsurgical treatment of diseases in adults. This includes the lion’s share of topics in clinical medicine, but certain areas fall outside of the boundaries of internal medicine, such as surgery and pediatrics. Subcategories of internal medicine include many medical specialties that are familiar to the general public. The American Board of Internal Medicine (ABIM), which certifies internal medicine physicians through administration of board exams, recognizes several subspecialties. Diagnosis and treatment of allergies, asthma, and immune deficiency disorders (allergy and immunology) or lung disorders (pulmonary medicine), and management of patients requiring life support and close monitoring in intensive care units (critical care medicine). Diagnosis and treatment of diseases of the heart and circulatory system. Diagnosis and treatment of diseases and disorders of the endocrine organs, hormone systems, and their target organs, as well as metabolic disorders. Diagnosis and treatment of diseases and disorders of the gastrointestinal tract including the stomach and intestines (gastroenterology) and liver (hepatology). Prevention, diagnosis, and treatment of adult diseases as a primary care practitioner (internist). Diagnosis, treatment, and prevention of diseases related to advanced age and management of conditions specific to aging. Diagnosis and treatment of diseases related to the blood (hematology), the treatment of cancer with medicine, including chemotherapy (medical oncology), and care that improves the quality of life of patients and their families facing problems associated with life-threatening illness (palliative care). Specialization in the overall medical care of hospitalized patients. Diagnosis, treatment, and prevention of bacterial, viral, fungal, and parasitic infections. Diagnosis and treatment of diseases and disorders of the kidneys. Diagnosis and treatment of rheumatism, arthritis, and other disorders of the joints, muscles, and ligaments. The University of Wisconsin-Madison is home to 11 schools and colleges, including the UW School of Medicine and Public Health (SMPH). There are 27 academic departments within SMPH, 17 of which are classified as clinical departments. The other 10 are categorized as basic and applied science departments. Of these departments, the Department of Medicine is the largest (see “Department of Medicine by the Numbers” below). Clinical faculty and staff members in the Department of Medicine are affiliated with UW Health, the integrated health system of the University of Wisconsin-Madison. UW Health serves more than 600,000 patients each year in the Upper Midwest and beyond with approximately 1,500 physicians and 16,500 staff at six hospitals and more than 80 outpatient sites. How many students are in the Department of Medicine? Technically, none. This seeming contradiction traces to the fact that the Medical Doctorate (MD) degree is conferred by the School of Medicine and Public Health, not the Department of Medicine, although hundreds of Department of Medicine faculty and clinical adjunct faculty members provide classroom and clinical instruction for MD students. Similarly, many of our faculty members serve as research mentors for students pursuing bachelor’s degrees, master’s of science degrees, or PhD degrees—but those degrees themselves are conferred by other units and programs in the university. The department is the academic home for the UW Internal Medicine Residency Program, in partnership with UW Health. After completion of medical school, residency provides three years of in-depth clinical training necessary for clinical practice and board certification in internal medicine. Physicians who wish to practice in internal medicine subspecialties then complete fellowship programs, which are usually one to three years long and provide advanced training necessary for specialization in fields such as cardiology, gastroenterology, infectious disease, or nephrology. Some physicians may complete further advanced training in sub-subspecialties such as cardiac electrophysiology. The Department of Medicine offers 22 different fellowship programs, as well as a physician-scientist training program called IMPACT that allows a fast-tracked residency (two years) plus a year of research training. Because residents and fellows have dual roles as clinicians-in-training and postgraduate learners, they are not considered to be “students.” Why? Because they are not pursuing a university degree program. By every measure, the department is making an impact on internal medicine. With hearts of service, minds of scholars, and the determination of a Badger, we’re honored to be an integral part of UW-Madison and UW Health—which have a combined annual economic impact of $12 billion, according to a 2015 study by NorthStar Consulting. An analysis of the economic impact of the UW System for the 2016-17 fiscal year concluded that UW Hospitals and Clinics, which has deep and continuing ties to the UW School of Medicine and Public Health, accounted for $3.5 billion of the UW System's total $24 billion economic impact for that year. 89 tenure-track faculty (which constitutes 20% of all tenure-track faculty in SMPH). 191 clinician-teacher track faculty (37% of SMPH clinician-teacher faculty). 126 CHS track faculty (21% of SMPH CHS faculty). 3 visiting faculty, a term used for tenured professors who have transferred to our university from another institution and whose tenure appointments are under institutional review at UW-Madison. For a total of 409 department faculty (26% of the entire faculty body of SMPH). Additionally, more than 300 adjunct department faculty in Wisconsin volunteer to provide clinical training for students, residents, and fellows. 115 Nurse Practitioners (NPs) and Physician Assistants (PAs) are affiliated with the Department of Medicine as integral and valued scholarly and clinical colleagues. Internal medicine residents have come from medical schools in 21 states (plus the nation’s capital) and countries. 100 percent of our residents passed their board exams last year, with a 3-year pass rate of 99 percent. This is tied for the highest pass rate among more than 100 university residency programs in the United States. Nearly 350 staff members on our team are dedicated to educating the next generation of physicians, advancing health, facilitating and conducting life-changing research, and ensuring the smooth day-to-day operation of the largest academic department in the UW System. 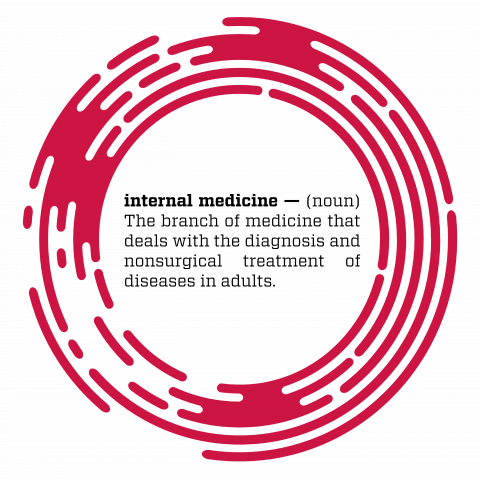 A uniquely collaborative culture has been a constant thread throughout our history. Here, the idea of standing on pedestals is dashed aside in favor of rolling up shirtsleeves. This is where an infectious disease expert partners with an evolutionary biologist to mine nature’s riches for new antibiotics, where a rheumatologist thinks like a systems engineer to propose synergism throughout a health care organization, and where a new philosophy of primary care is born through team effort. In addition to thinking broadly, our researchers also unravel secrets of the human body’s tissues, cells, and molecules: endocrinologists discover how to coax the body into protecting insulin-producing cells, cardiologists determine how heart cells can be timekeepers, and oncologists find ways to trick cancer cells into lowering their defenses. The department’s culture of collaboration not only extends across disciplines, but across the exam room. We believe that patients are partners in healing. We strive each day to act according to our patients’ needs while being guided by their life experiences. And we believe in our trainees—encouraging them to delve deeper into the field of medicine, and to fully realize their own potential through the power of self-reflection and the courage to be agents of change. Today marks a remarkable chapter in the department’s history. Take the pulse of our graduate medical education programs and you’ll observe some of the most humble, compassionate, and well-prepared early-career physicians in the nation. Gauge the work of our researchers, and you’ll notice that we tackle the most vexing problems in medicine and health care. Examine the efforts of our clinicians, and you’ll witness our dedication in examination rooms, hospitals, and consultations that reach patients throughout Wisconsin and beyond. This energy is eclipsed only by the possibilities of what the future may bring. The physician Oliver Wendell Holmes once said, “A mind, once stretched by a new idea, never regains its original dimensions.” Our aim is that together, we will continually stretch the boundaries of medicine—forever transforming the field.